We provide unparallel protection for complete and secured web accessibility. Our MLM Software security also provides protection on your web applications with the help of security gateway that guard your application against sudden attacks. Your distant employees can securely connect to your network with our SSL Virtual Private Network, provided that, they have access to web browser. 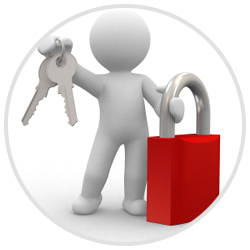 MLM software Kolkata's Software based services are ensured by SSL Certificate. Secure Sockets Layer is a protocol developed by Netscape for transmitting confidential documents via Internet. Through SSL encryption, the certificate gives surety that information is kept private between your web server and your recipient's web browser. Server Mirroring provides real time availability of current server data that are exact duplicates of current files and folders between servers. This process of Server Mirroring is intended for purposes like disaster recovery, load balancing and high availability. Duplicating files and folders for branch office for closer proximity of information in the end-user. Another significant usage of Server Mirroring is data retrieval with minimum downtime for server backup system. Colocation is one of the best hosting options available for business houses today that provide the most standard hosting facilities which encompass the features required by large IT sector. Many big Colocation providers have team of IT professionals and the internet infrastructure to manage the Coloction server system. Colocation can be a more profitable hosting option offering high bandwidth speed and better redundancy for the network connections. Thus Co Location is more economic way that helps in saving the cost of bandwidth. It facilitates better outage protection. Security is the main forte assured through Colocation where server is stored and maintained in a protected environment. Automated daily backups of all the selected files provide the secured way of storing a copy that have been revised and altered on the day the daily backup is performed. This option is provided for more convenience in the back up process. An essential part of management is daily monitoring of software and database so that a company can constantly access and monitor database performance information. Monitoring of database helps us to understand the status of the database. Database monitoring solution proves to be profitable in a varied way by increasing profit, as there is no loss incurred by undetected database failures. A reliable access to the database is another achievement of Database and software monitoring.